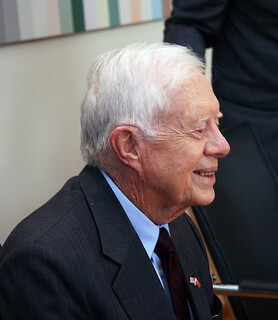 President Jimmy Carter criticized the way the Obama administration has handled the civil war in Syria. In an op-ed in the New York Times the former president said the U.S. made the wrong decision in demanding Syrian President Bashar al-Assad step down. Since the civil war began in Syria the situation has escalated. The U.S. and Russia both began air campaigns in the country. Russia supports the Assad regime. Carter said he thinks countries with interests in the region need to join together to restore order, which will mean Assad maintaining power for the time being. Carter wrote that either Assad has a role in a political solution or the war will continue and ISIS will continue to become a greater global threat.